The DG08 mechanical flow indicator is used for visual verification of the flow of liquids or gases. The liquid or gas being monitored lifts the PTFE ball from its valve seat. As the flow increases, the ball in the domed sight glass becomes increasingly visible. These devices are made of high quality materials, allowing them to be used with a great variety of liquids or gases. 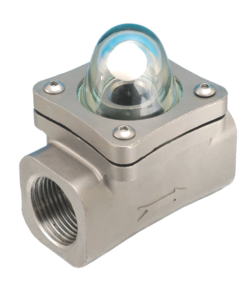 DG08 mechanical flow indicators are used to monitor the flow of liquid or gaseous media. These devices are especially suited for use in industrial systems and for process monitoring as well as for basic monitoring of compressors, ventilators, fans and many other types of similar equipment.